These “overhead” process can take a considerable amount of time that you could be spending writing code. Using test-kitchen will help to reduce the amount of time you spend on the overhead and allow you to concentrate directly on writing your automation. 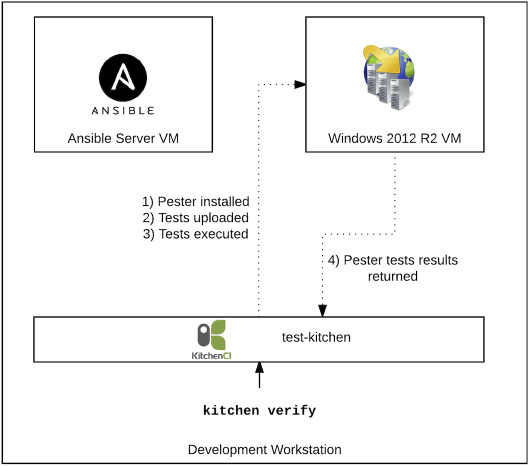 Ansible provides some additional challenges when trying to use test-kitchen. The way Ansible applies automation against nodes is by using SSH for Linux and WinRM for Windows. As Ansible was designed to be run on Linux, it is very easy for a Linux node to have Ansible installed locally and do a local apply of the Ansible configuration to itself. Unfortunately, as Ansible does not run on Windows, you are not able to do a self-apply. This means we need a way to stand up a Linux machine, install Ansible and then make a WinRM connection from the Linux machine over to a Windows node to apply the configuration. 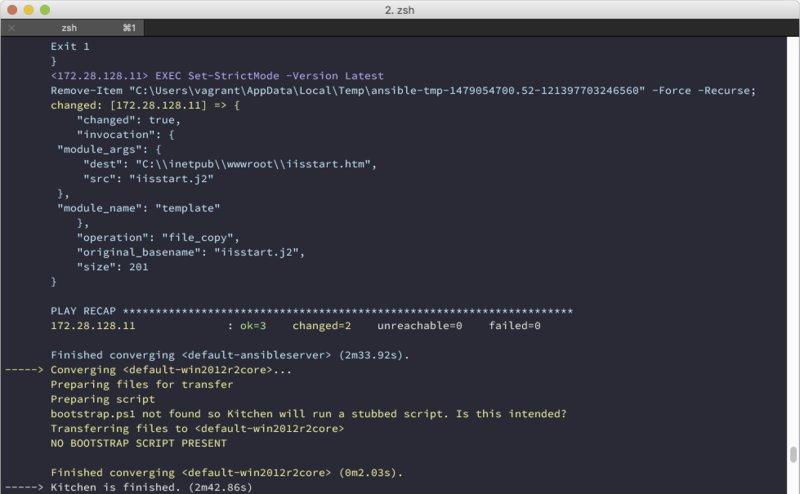 Thankfully, someone has done the hard work for us and created kitchen-ansible, a plugin for test-kitchen which handles this process. 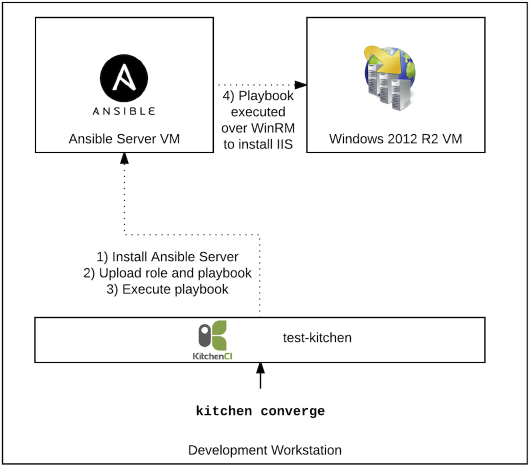 To use the test-kitchen workflow with Ansible and Windows nodes, we will need to install a few requirements. ChefDK - even if you are not using Chef, ChefkDK (development kit) installs everything you need to run test-kitchen from a single installer. This is especially useful on Windows where working with different ruby versions can be slightly painful. Once the requirements are installed, we will need to install some additional Ruby gems which. The ChefDK comes with its own ruby environment, so we will install the gems there. With that, we are ready to look at the test-kitchen workflow. The way test-kitchen works is by looking at a .kitchen.yml in the directory the command is run from. You can use the kitchen init command to generate a .kitchen.yml for the current directory, where all your configuration options for your kitchen run will go. If you want more of the basics about how test-kitchen works, you can have a look at the kitchen.ci site. For the rest of the post, I will be focusing more on using test-kitchen with Ansible as opposed to basic test-kitchen usage. You absolutely should be using roles. Roles are great. Use roles. Roles! Did we say that enough? Roles are great. Inside the acme/ folder, create a directory called kitchen. This is where we will put all the required things for test-kitchen to work. Here is a look at what the directory structure means. This means to use the .kitchen.yml for the Ansible role, you need to do it from the kitchen\ directory. I have created an Ansible role which installs IIS and updates the index.htm page. It also contains Pester tests. You can find the entire repository here: https://github.com/MattHodge/ansible-testkitchen-windows. The kitchen configuration is generic so it can be used with ANY Ansible role repository. 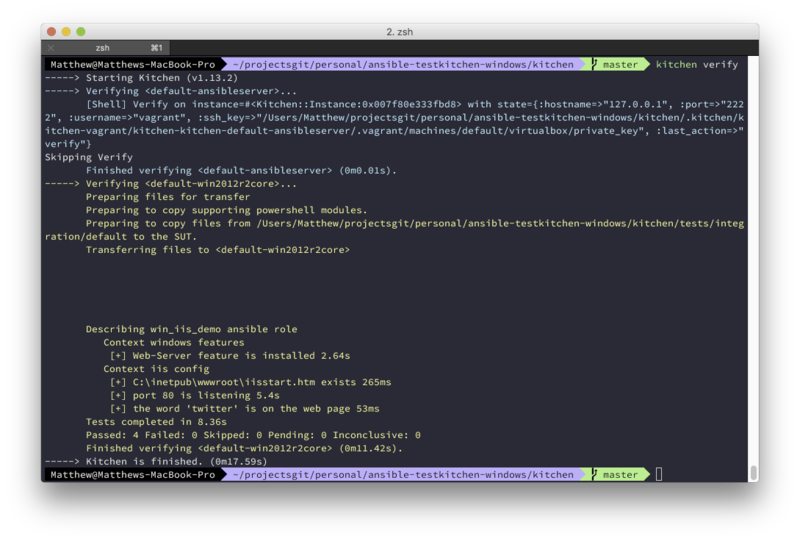 All that you would need to do is update the Pester tests in kitchen/tests/integrations/default/pester/default.tests.ps1. Once you have the .kitchen.yml file ready, you can now start the test-kitchen workflow. There 4 major commands you will be using with test-kitchen as part of your workflow. Running kitchen list reads the .kitchen.yml and shows you the current state of the environment. 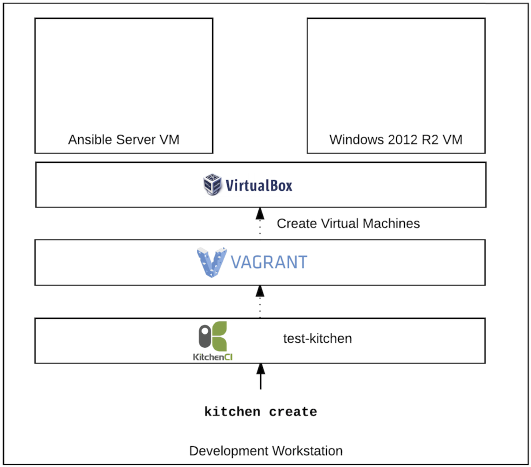 Running kitchen create will use the kitchen-vagrant driver and provision the virtual machines, a Linux machine to run Ansible from and a Windows machine to apply the playbook against. It also runs the ConfigureRemotingForAnsible.ps1 script to configure WinRM so it is ready for an Ansible connection. Executes the playbook against the Windows VM detailed in the inventory/hosts file. The connection information for the Windows VM is stored in group_vars/windows-servers.yml. As you are developing your Ansible role, you can run this command, again and again, to re-upload the role and re-run it without having to create the VM’s again. Running kitchen verify installs Pester on the Windows VM and then uploads the default.tests.ps1. It then executes the Pester tests and returns the results to the console. Running kitchen destroy will delete the virtual machines. Simple! Using test-kitchen is a great way to speed up your infrastructure automation development process. It also enables you to use the Test-driven development (TDD) process very easily. Developing in this manner gives you a huge confidence boost when making changes to your code. Be sure to take a look at the https://github.com/MattHodge/ansible-testkitchen-windows repository for the entire file structure, and use it as the base for all your Ansible role to make them testable!